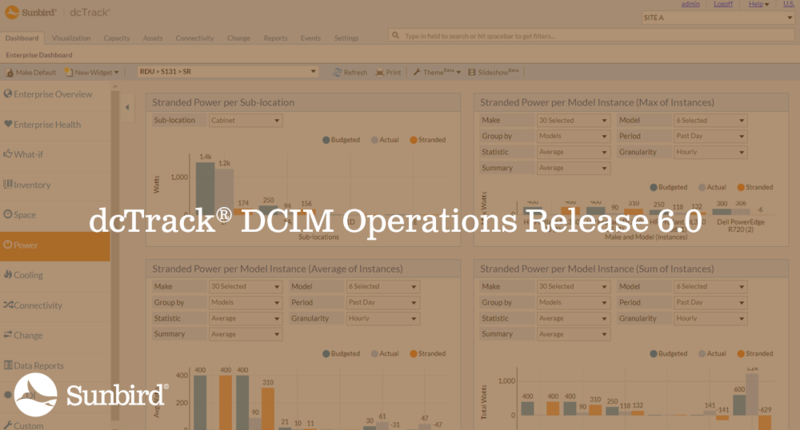 We’re thrilled to announce the general availability of dcTrack 6.0, the latest version of Sunbird’s DCIM Operations software. New dashboards and visualizations in dcTrack 6.0 make it faster and easier than ever for data center managers to get the information they need to plan and manage data center capacity more effectively. Additionally, improvements to requests and work orders ensure that the work required for more effective capacity management gets done right. The dcTrack 6.0 update is available worldwide on a cabinet/month subscription or perpetual license basis to all customers with valid maintenance contracts. Simply download the update file from Sunbird’s support portal to upgrade today. The Dashboard tab in dcTrack 6.0.0 has been enhanced with new What-If and Data Center Optimization Initiative (DCOI) dashboards to provide one-click access to business intelligence to help you better manage your data center. The What-If dashboard provides widgets that display the impact of changes on a project and sub-location basis so you can utilize capacity better and delay costly equipment expenditures. The widgets on the DCOI dashboard are designed to track and measure compliance with the DCOI mandate’s key metrics. dcTrack 6.0.0 introduces new cooling and stranded power widgets to the Dashboard tab. The Cooling Capacity widget is a gauge chart on the Cooling Dashboard that shows the cooling capacity remaining in Cooling Tons or kW versus the present heat budget load from the equipment. Five new standard power widgets were added to help you find stranded power per location, per sub-location, and per sum, average, and maximum for model instances. Each widget includes data series for Budgeted, Actual and Stranded power. In Release 6.0, the 3D thermal floor map visualization and time-lapse video have been enhanced to support vertical as well as horizontal sensors. Users can quickly visualize the thermal gradient in the vertical plane and view additional information with respect to temperature. A new 3D air pressure floor map overlay with time-lapse video enables users to view visualizations over specific periods so they can quickly spot trends related to airflow uniformity and efficiency. To accurately depict airflow design, perforated tiles can be placed on 3D data center floor maps, with the percentage open configured for each individual tile. Tiles can be tracked as assets, so users can export the data and use it in computational fluid dynamics (CFD) applications and other systems. Previously only available in the Windows client, request and work orders have been enhanced for the web. Following the stages of the request workflow, once a change request is approved, a work order to perform the requested task is generated. Once the work order is complete, the request can be marked as complete. Users can sort and filter requests and work orders and then save personalized, filtered views that show only the items relevant to them or to their teams. The history of each request is tracked within the software so users can measure workflow effectiveness, determine if target intervals are being achieved, and maintain a record of the work completed for future reference. Multiple requests can be aggregated in a single work order to decrease the number of physical trips to the data center required to complete the work. Our patent-pending Quick Connect feature help our users find the best ways to make data and power port connections significantly faster and with fewer clicks. Once a user identifies the start and end points, dcTrack will display the best available connections and, based on the user’s selected option, create the circuits automatically. With Quick Connect, users can quickly create connections without needing to understand the intricate details of the cabling and infrastructure between the connection points. Other improvements in dcTrack 6.0 include role-based access control for custom fields, optional power supply ports for models and items, REST and external ticketing (SOAP) API enhancements, and updates to address customer-reported issues and security fixes. For more information on what’s new on dcTrack 6.0, check out the official press release and release notes. Ready to upgrade? Download the upgrade file on the support portal.